If user projects are enabled, authenticated users are able to set up their own projects in order to group isolates for analysis. If private data and user quotas are enabled, these projects can include private records that can then be shared with other user accounts. Note, that simply adding a record to a user project does not make the record itself private. User projects can be enabled by an administrator by setting ‘user_projects=”yes”’ in the config.xml file for the database. 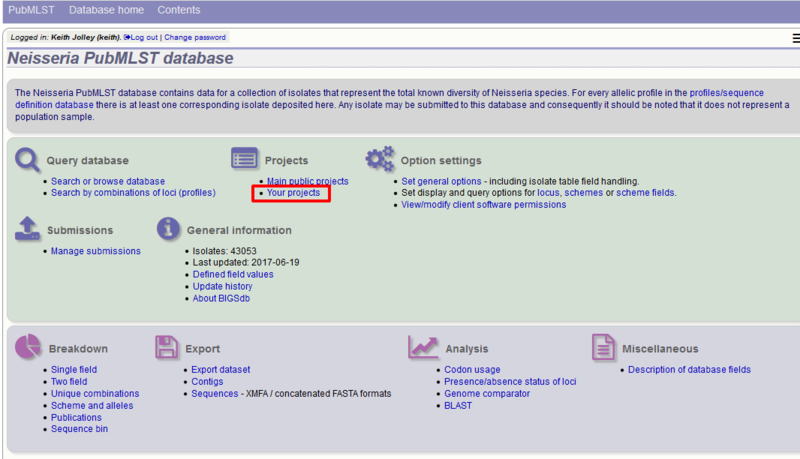 To create a new project, go to the isolate database contents page and click ‘Your projects’. Enter the name of your project (this must be unique on the system - you will be told if the name is already used). You can optionally include a description - if you do this, this will appear within isolate records when accessed from your account. Click ‘Create’. You can either add isolates to your project directly following a query or by manually editing a list of ids. Perform an isolate database query. 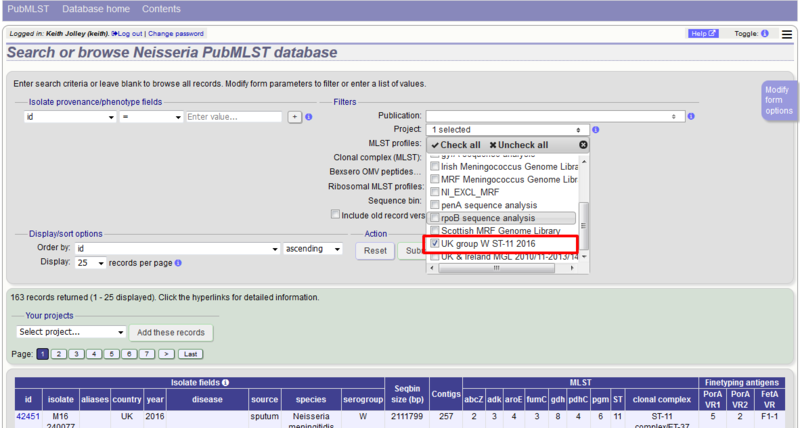 If you have set up a project, there will be a link in the results header box. Select your project and click ‘Add these records’. The records will be added to the project. Please note that it doesn’t matter whether any of the records have been previously added. From the user projects page, click the ‘Add/remove records’ link for the project that you wish to modify. Edit the list of ids of records belonging to the list. You can copy and paste this list if you wish to prepare it in a spreadsheet or text editor. Click ‘Update’ when finished. 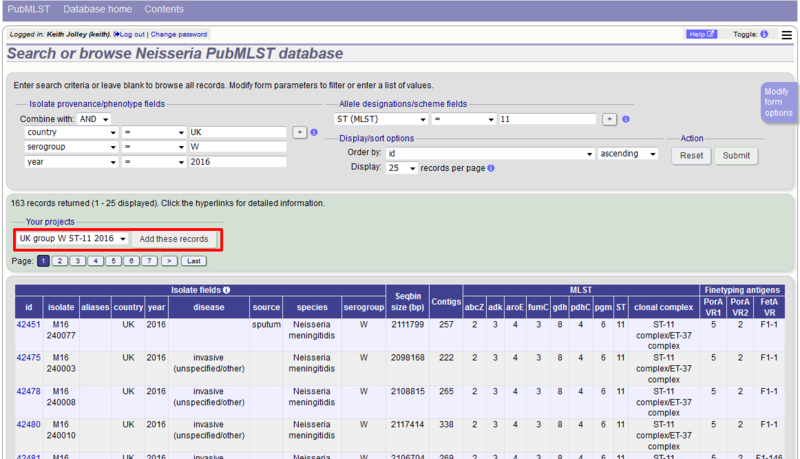 To browse isolate records belonging to a project, go to the user projects page and click the ‘Browse’ link for the project. Please note that you will only see your project in the filter list if you are logged in. As a private project, only you will see it. You can share a project that you own with any other user. In order to do this, you must know the username that they use to log in with. They will see the project in their own list of private projects and in the query interface projects filter. If user groups are in use, you can also share your project with all members of a user group from the same page. 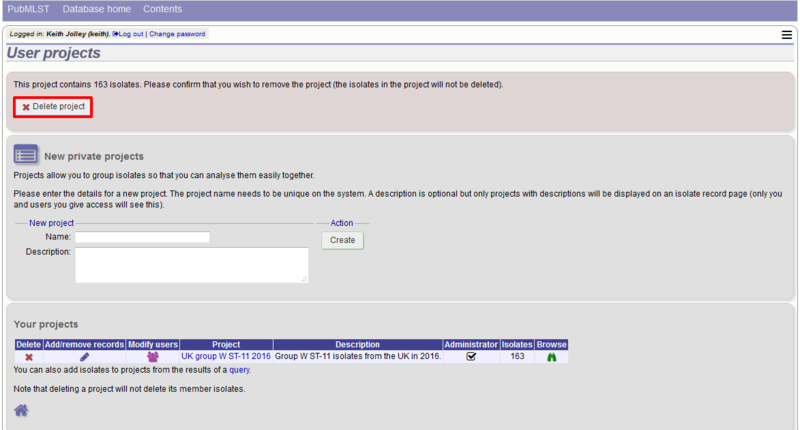 You can delete a project from the user projects page by clicking the ‘Delete’ link next to the project in question. If the project contains any isolates you will be asked for confirmation. Click the ‘Delete project’ button. If the project contains no isolates, the confirmation page is skipped and the project is removed immediately. Removing a project does not delete the isolate records belonging to it. A project is simply a means of grouping records.